The disappearance of a rare bird of prey in "suspicious circumstances" is being investigated by police. The male hen harrier is believed to be dead after its satellite tag stopped transmitting near Calne, Wiltshire. 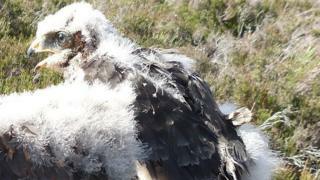 The chick, named Vulcan, was one of five fledged in Northumberland last summer and tagged by the RSPB. Vulcan is the 11th satellite-tagged hen harrier to have "vanished suddenly" since last summer, a spokesperson for the charity said. The young bird's movements were tracked by the RSPB as it flew from Northumberland down to the Peak District. But in mid-January its tag suddenly stopped transmitting just south of Calstone Wellington. No damaged tags or remains of the protected bird have been found. "When a bird you've been following since it was a chick suddenly disappears without a trace, it's a crushing blow," said Ms Thomas, from the RSPB's Hen Harrier LIFE project. "Vulcan's tag had been performing brilliantly, so for it to suddenly stop transmitting makes us very suspicious that something has happened to him." Hen harriers are one of the UK's rarest birds and are protected by law under the Wildlife and Countryside Act 1981. However, the species is also the most intensely persecuted of all the UK's birds of prey because of the threat they pose to game birds and free-range fowl. PC Marc Jackson, from Wiltshire Police, said its rural crime team was working with the RSPB to "establish the circumstances". "To find no trace of this bird raises obvious concerns about what may have happened to it," he said. Gareth Cunningham, from the RSPB, said Vulcan's suspicious disappearance also "raises serious concerns over the safety of any planned reintroduction" of these "magnificent birds". "We believe ending hen harrier persecution is the key to restoring the UK's population," he said.